We love Mod Podge, and are actually obsessed with Mod Podge DIYs. We think it was made just for us since it's easy to use, quick drying, and pretty fail proof (which we have put to the test). Thanks to Tatertots and Jello for helping to keep our addition alive with this wonderful resin ring DIY!! Hey Jelloheads! That’s totally what a follower of Jen’s is called, and I am one too. 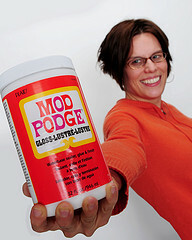 It’s Amy from Mod Podge Rocks – your guest host today. If you don’t know me, I blog about Mod Podge and everything that you can do with it. I also love the color blue, garden gnomes and pugs. In my spare time I’m writing a book (that Jen is going to be in!) and I’m training for a 1/2 marathon. Nuts? Maybe. Loveable? I hope so. Jen has been obsessed with Mod Podge Dimensional Magic lately, and I can’t blame her. It’s completely awesome. 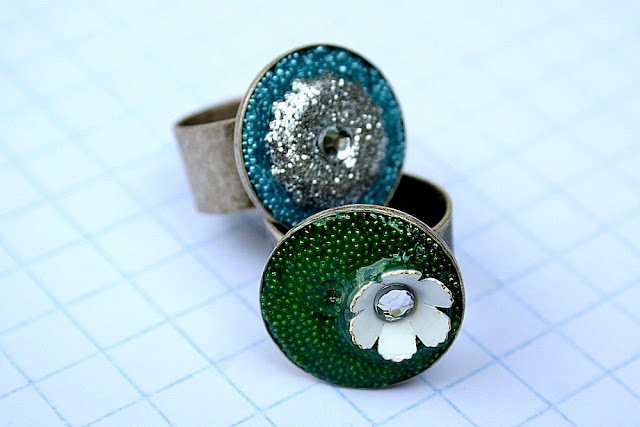 I made these rings, one of my favorite (and easiest) Dimensional Magic projects, and I’m going to share with you the three step tutorial. They are so inexpensive, you can use existing supplies that you have and they make great gifts. Here we go. 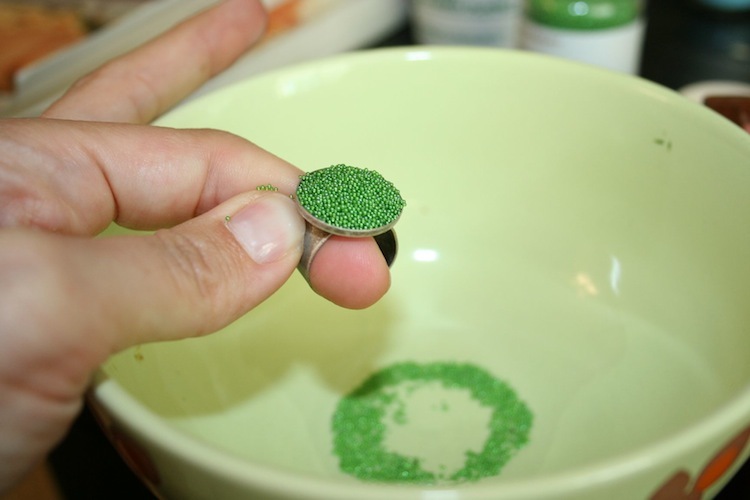 Keep in mind that if you don’t have the microbeads, you can use paper – just cut it to fit and stick it down in there with Mod Podge. Okay, so here we go. 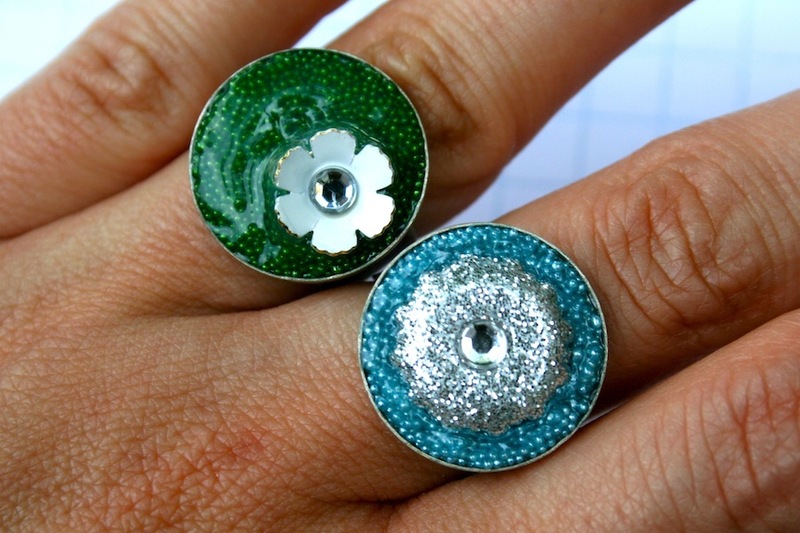 Get some ring blanks from your local craft store. They are pretty inexpensive. 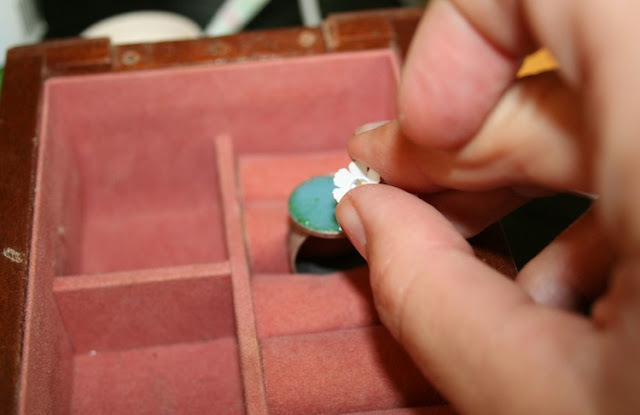 Find a place to secure your ring blank and add a thin layer of Dimensional Magic to the bottom. Note – never shake your Dimensional Magic bottle. It adds bubbles. Shake some beads into the Dimensional Magic. Let it dry and then dump off excess beads. 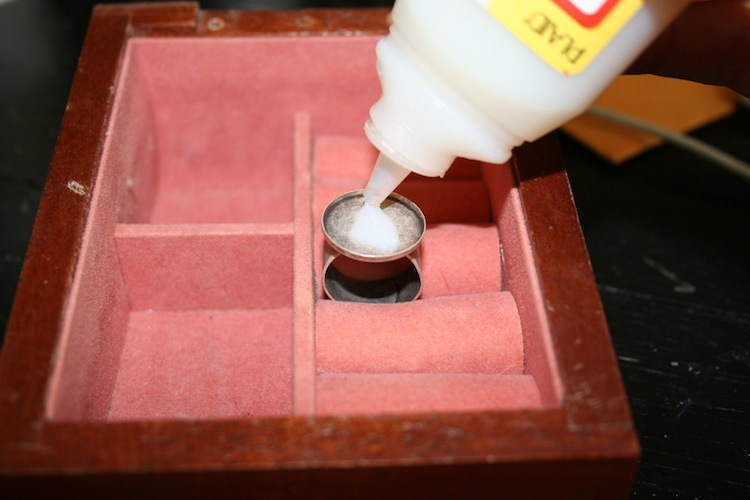 If you haven’t filled the ring blank, repeat (you can layer Dimensional Magic). 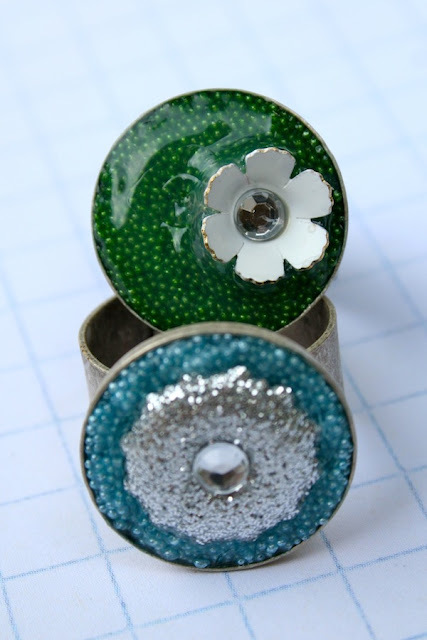 Add another layer of Dimensional Magic on top of your beads and then stick in the embellishment. Let dry in a warm place (NOT under a fan) for several hours. You’re done! Repeat with as many rings as possible.